Based on the children's novel "The Adventures of Pinocchio", "Pinocchio" was supposed to be Disney's big follow-up to their big hit "Snow White and the Seven Dwarves". Released in February 1940, and despite positive reviews from critics, the film was a major disappointment at the box office. Maybe this was because the film couldn't open in certain markets because of World War II, or maybe the box office returns just seemed disappointing because the unprecedented success of "Snow White..". Either way, most people wouldn't expect a film that's so well remembered today to have bombed during its initial release. 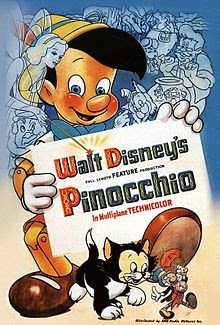 But, thankfully, how "Pinocchio" preformed in 1940 has nothing to do with the quality of the film. The film was everything people expected, and more. The film opens with its signature song "When You Wish Upon a Star", and Jiminy Cricket introducing the story. Gepetto is a lonely old woodcarver who lives with his adorable cat Figaro and goldfish Cleo. He carves Pinocchio, a puppet, and one night wishes that he would become a real boy. The Blue Fairy arrives and grants Gepetto's wish, and tasks Jiminy with being Pinocchio's conscience. The rest of the film follows Pinocchio's adventures as he is led astray various times. There are some dark parts, like where Pinocchio is tricked and taken to Pleasure Island with other misbehaved little boys, and where they get caught up with gambling, smoking, getting drunk, and are all turned into donkeys. And there's another part where they're all swallowed by a whale, but everything turns out okay in the end. The story is heartwarming. It takes many twists and turns, without taking away from the central message. There are themes of morality, having your wish come true, and living up to expectations. The film goes much deeper than "Snow White", which is essentially a story of good vs. evil. Yes, that theme can be applied here, too, but there is a more complex examination of each side. There isn't one villain, like The Queen in "Snow White", but rather three; Honest John and Gideon the Cat, Stromboli, and Monstro the whale. There's humor, depth, stakes for the characters, and the main reason I think this is one of the greatest films Disney has ever made, the animation. This film was released in 1940, and for that time, the animation in the film is phenomenal. The visuals are just so stunning and breathtaking, that it's hard to believe there are many films that can surpass this type of master artistry. Just look at any scene from the last few minutes of the movie, and try to compare it to any other animation produced during this era. Not an easy task. There is so much more detail than "Snow White", it's hard to believe they were released only three years apart. Luckily, this film has not gotten a reputation for sending the studio into near financial ruin, and has instead been remembered for its achievements in animation and story. It should also be noted that the film did eventually turn a profit thanks to a reissue in 1945. "When You Wish Upon a Star" has become the anthem for the Disney brand, and "Pinocchio" was the first animated film ever to win a competitive Academy Award. It won two Oscars, for Best Original Score, and Best Original Song. The film is rightfully, considered one of the greatest animated films ever made, and, in my opinion, is even better (if only slightly) than its predecessor, due to the level of emotion and complexity through storytelling and animation, that "Snow White" just didn't get to. But they are both great films, two examples of the kind of magic Disney is known for around the world. 5 Ways to Improve "The Crazy Ones"